I am delighted to hear of your pregnancy. A baby is always a cause for celebration. I know both you and the Daily Mail will be ecstatic. It must have been terribly irksome having to compete for column inches with a proper Royal Wedding and the celebrity offspring of another prominent Queen, but rest assured, you are bound to keep upstarts like Cher Lloyd and the ubiquitous Kardashian sisters in their place for some time yet. Just once teensy, weensy request from one beleaguered mother to another. Would you mind eating just a bit of dinner during this pregnancy? Just a few mouthfuls every now and then in order to make sure us lesser mortals who can’t control our weight don’t feel overwhelmed by despair and self-loathing at our lack of control when we survey photos of your non-existent 20 week bump. I know that Dave has abolished the Health in Pregnancy grant, but I’m sure you can stretch to the odd bit of roast lamb every now and again. Also, it might be nice, if whilst in the midst of being superglued to the feeding chair for 24 hour breast-feeding marathons, we weren’t subjected to photographs of you losing the baby weight before the child has even been delivered. Nor the obligatory photograph of you back in your size zero skinny jeans, impeccably made up, coiffered and manicured, 20 seconds post-birth. I know you have the money and resources to have a tummy tuck at the same time as having your section, I don’t blame you, I’m sure in your situation we’d all do the same, but you know what, it might actually earn you quite a lot of respect from amongst the ranks of us lesser mortals, who can’t afford personal trainers, chefs, make-up artists, nannies and the like, to be assured that behind that robotic facade there is a human being. Appearing in public with just a hint of the baby weight would perhaps be the most positive gift you could give to your newborn, particularly if she is your much-longed-for baby girl. A mother who was informed today that she looked as though she might be about to drop at any minute and who has another 15 weeks to go. 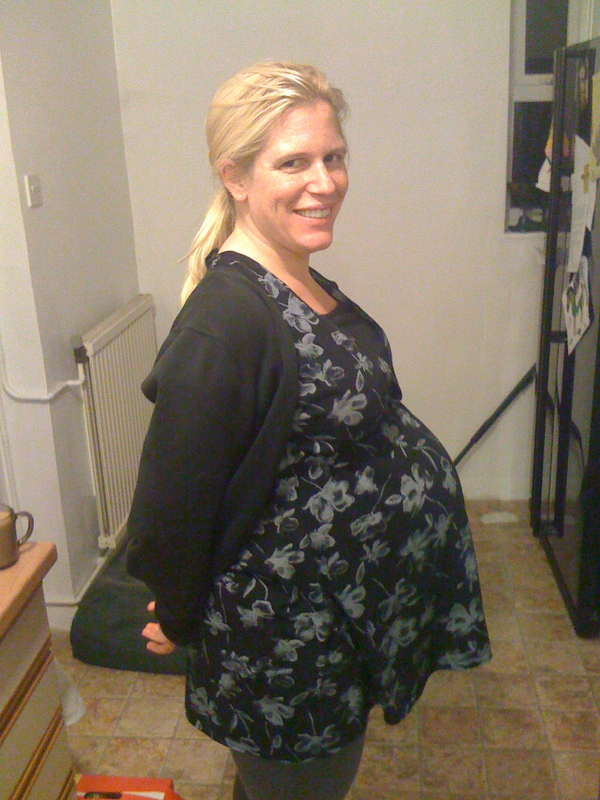 PS Just for good measure, I’ve put in a photo of myself taken at 40 weeks, on the date my daughter was due. Rest assured, you’re never going to look this bad. I always felt Posh looked well when she had her pregnancy with Romeo. Spurs. Healthcare in North London v Healthcare in LA?